Points history for Gilly can be found here. 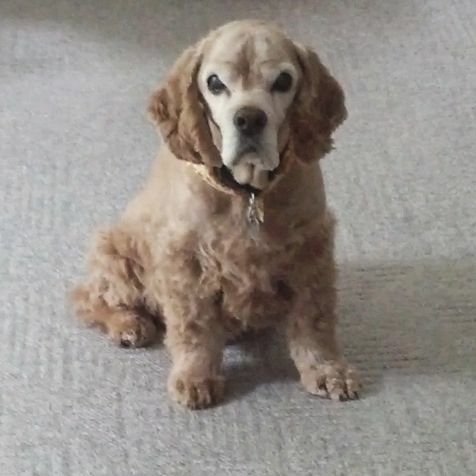 Gilligan (Gilly) was an American Cocker Spaniel who served as the Weston Whirlwinds only height dog for several years when the team was just starting; we were lucky to have him as part of the team. We suspect that Gilligan's happiest years were the several when he did flyball, during which he had time with his owner Mindy and away from his younger brother Skipper, who stole all the attention at home. At flyball, he quickly learned his job and did it well, and though he didn't seem to get the hang of getting faster, he ran those little legs as quickly as he could. A typical cocker, he ran not only for the ball and the joy and to please, but also for the treats! He loved traveling with the team, and when Mindy retired from traveling we were still honored to be able to bring along Gilly with us to the tournaments as we still very much needed the very consistent and sweet height dog. While several on the team served as his on the road parents, most often that role was filled by Angelica. We have photos of him sleeping on the bed with his teammate Koffan. Kate had the special pleasure of having Gilly stay with her after he had a run in with a skunk - we won't forget that tournament! During the long waits between runs, he snuggled in any lap that was willing to oblige, whether it was Mindy, Angelica, Kate or anyone else. Prior to joining the Weston Whirlwinds Gilly raced with ARFF. 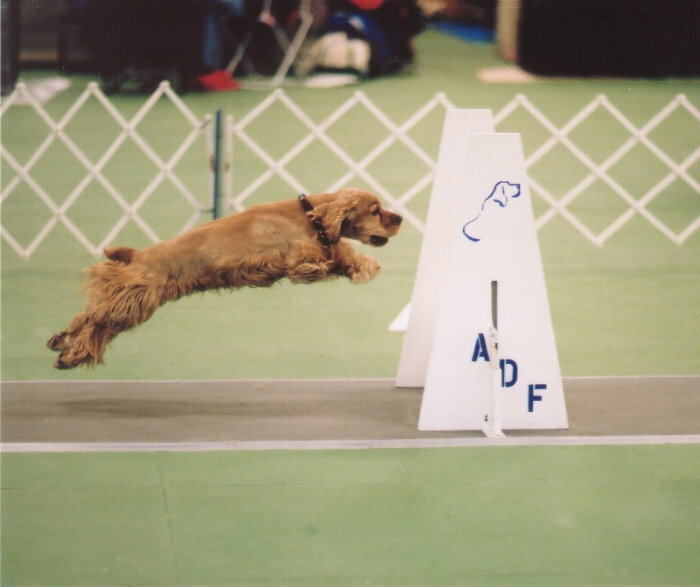 ARFF once did a Flyball demo at the Boston Garden, and when the race started Mindy released Gilly for his turn but instead of going up the lane he made a beeline for someone on the sidelines eating a hot dog! Typical Cocker Spaniel! He did get it together and was a star in the second race once he realized this special field trip was not all about the food. We will all miss Gilly and we are sure he is at the Rainbow Bridge playing Flyball (and eating treats) with the rest of his Flyball friends!